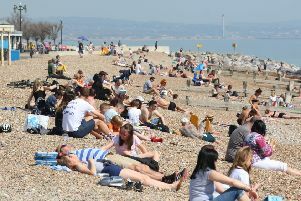 Sunshine and showers have been forecast for Sussex this week. Today will see showers this afternoon which will become heavy and blustery, with some strong and gusty winds. Maximum temperature 10 degrees. Tonight will be cloudy with showers or longer outbreaks of rain, some locally heavy at first. The showers are forecast to become largely confined to the east later. Windy at first, but moderating through the night. Minimum temperature three degrees. Monday will be mostly dry with sunny intervals. A few showers likely, these mainly towards Kent. Lighter winds. Maximum temperature 10 degrees. Tuesday is set to be mostly dry and bright but turning cloudy with rain later. Wednesday looks to be cloudy, damp in the morning, followed by drier brighter conditions and windy. Thursday is forecast to be cloudy with some rain.